Abigail Rockwell discovers a 1920 advertisement from her grandfather Norman Rockwell’s Edison Mazda series. Very early one morning, I couldn’t sleep so I went on Facebook. I was scanning the feed, looking for something to connect to, hold on to, perhaps transport me. I happened upon a friend’s post of this painting depicting a boy in bed. It immediately drew me in. It’s evening, and he’s sitting up in bed, intently reading. Completely absorbed. So focused on his book that he tilts the lamp to directly shine its light so no text is obscured, and shuts out all distractions. Who painted this? I wondered. I had somehow overlooked the signature. 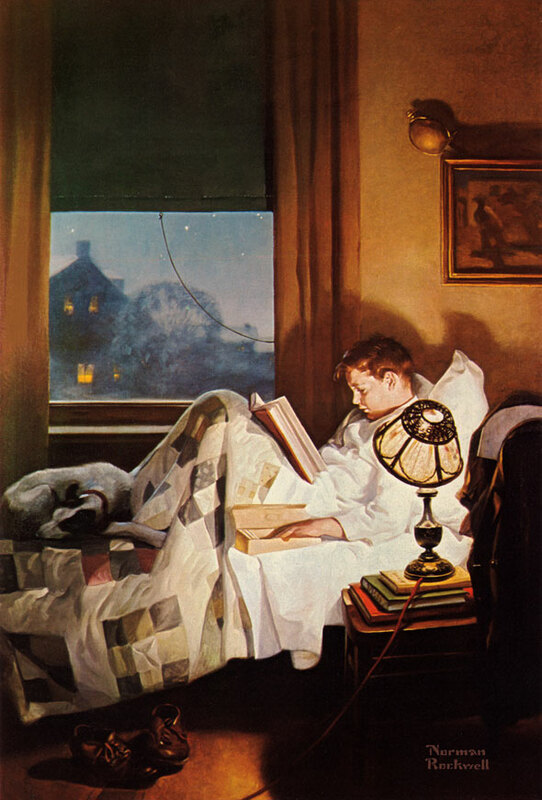 It was so early in the morning; my experience was one of falling into the reality of the painting — I was as absorbed by it as the boy was with his book. There seemed to be all these secrets in that room waiting to be revealed. I started to explore all the details. I noticed the subtle, gentle way the view outside his window was painted; the welcoming lights of the next-door neighbor’s, the first stars peaking out of the sky. The cord of the window shade inexplicably caught in the drapes — this detail fascinated me. A quiet, off-kilter wink that directs your attention back to the boy instead of out the window. I noticed the hilt of the sword stuck behind the painting on the wall above him, difficult to make out at first. An indication of adventure. Some sort of animal and a man are pictured in the painting — the man appears to be backing away from the beast. Deep shadows against the wall create a powerful silhouette of the boy and contrast with the very strong light of the lamp. I almost missed the dog, sleeping contentedly, one with the quilt and the line of the boy’s propped up legs. Then I noticed the worn shoes, one resting on the other, mirroring the dog resting on the boy’s feet. Those look like Pop’s shoes, the kind he would draw. Pop loved careworn shoes of all kinds. I was puzzled. Again I thought, Who painted this? See the complete set of the Edison Mazda Advertisement series illustrated by Norman Rockwell from the pages of The Saturday Evening Post. I noticed the books on the side table, and the lamp cord falling into shadow beyond the light’s reach. The dog’s markings reflect the pattern in the quilt mirroring the pattern of the glass lampshade. And what is the boy eating – is that a box of crackers? The magic of the painting held me for quite a while. I didn’t want to leave the comfort and safety of that room, the boy’s world and that private moment. I went back to my friend’s page and saw that he had credited the image in another post. It was a Norman Rockwell! How could I not have known?! It was an epiphany. Never before had I seen my grandfather’s work with fresh eyes — for the first time I didn’t bring my history into viewing it. I had complete purity of vision, and I now understood what people have always said to me — that to enter into the magic of one of his paintings, the world he created, is to be truly transported. This painting is part of the Edison Mazda series that my grandfather painted from 1920 to 1927. I mentioned this series in my last post on Young Valedictorian. I particularly love this series — it speaks to the adventure, enchantment, and safety of childhood. P.S. It is titled And Every Lad May Be Aladdin (Crackers in Bed), Edison Mazda advertisement, 1920. Now we know what’s he’s eating! Thanks for your helpful comments Helen! I knew Lucas and Spielberg owned many original Rockwell paintings, but didn’t think about that yesterday when replying here. It may have been because these were ads; not sure. I’m glad they’re in good hands. It would be nice though to have reprints of those available too for framing, for your home or office. Maybe they will, let’s keep good thoughts! Many of the original Edison Mazda paintings that were done by Rockwell are owned by George Lucas. They were on exhibit in Washington, DC a number of years ago along with Rockwell paintings owned by Steven Speilberg. This was really good fortune for you to have found this intriguing, fascinating work of art by your grandfather. Just as important, you have the real, colorful original here. As great as the actual ad is, it doesn’t have the same impact to really be appreciated, savored, and studied the way the above picture allows you to. I loved all of your observations, and how you notice such subtleties as the correlation of the boy’s shoes and the dog resting on his bed. The picture on the wall (with that sword) is pretty unusual. The shadow created on the wall by the boy’s head and pillow corner almost look like a ghost—something a lot of children are frightened of. Thank you and the POST for running Rockwell’s other ads in the series, and would like to comment on a few while I’m here. The children at their mother’s knee is beautiful, and the ad copy under it is brilliant. The boy turning on the light, really surprising the man downstairs is great! The little girl’s birthday—look at that lampshade, and again the ad copy. Another incredible lamp in the boy studying with his dad. I can say the same about the elderly couple reading, and the couple sitting in front of (what I figure is) the fireplace. I was wondering if you have the additional Edison-Mazda Rockwell ad portraits in addition to ‘Aladdin’ here, or have a way to obtain them? If anyone should have them, it is definitely you!